For more information about the parks or to reserve space at Amerson River Park, please contact Macon-Bibb Parks and Beautification. The Amerson-Riverside Cemetery Connector trail is one of the most significant expansions of the Ocmulgee Heritage Trail system ever. This expansion will connect existing trail in Riverside Cemetery to existing trail in Amerson River Park. The connector will initial consist of approximately two miles of trail along an easement near the interstate owned by the Macon Water Authority (MWA). During a relining project in 2017, MWA installed several permanent culverts to create a connection along this easement. Construction cannot begin until after the Water Authority completes work on its sewer line, which is scheduled for completion by July 1, 2018. In addition, the Trail is still working to craft an agreement with the railroad to access this trail where it will cross railroad easements. The Trail is expected to cost approximately $500,000 if it’s done in gravel or $1.5 million in concrete. Eventually, plans call for two scenic overlook trails that will loop off the connector trail: one to the north near Amerson and one to the south near Riverside Cemetery. The South River loop consists of 2,500 linear feet of trail and an 80-foot bridge. This trail branches off from the Amerson-Riverside Connector near Riverside Cemetery towards the river. The 2016 class of Leadership Macon raised the funds to construct and set the bridge, but additional funding will be required to construct trail to connect either end of the bridge to existing trail. The remaining trail will cost approximately $125,000 if done in gravel or $500,000 if done in concrete. This loop will provide beautiful views of the Ocmulgee River. Construction of the South River Loop is contingent on additional fundraising, an access agreement with the railroad, conclusion of MWA construction and impacts from I16/I75 interchange construction. The North River loop consists of 1,400 linear feet of trail and a 40-foot bridge. This trail branches off from the Amerson-Riverside Connector near Amerson River Park towards the river. The bridge is expected to cost approximately $50,000. The remaining trail will cost approximately $75,000 if done in gravel or $250,000 if done in concrete. The total project will cost between $125,000 and $300,000. Construction of the North River Loop is contingent on additional fundraising, an access agreement with the railroad, conclusion of MWA construction and impacts from I16/I75 interchange construction. The Walnut Creek Connector Trail will connect the existing trail from the Otis Redding Bridge to the River Trail in the Ocmulgee National Monument. NewTown Macon has raised and expended approximately $200,000 to date on this project. Several years ago, interchanges were added to connect the sidewalks of the east side of the Otis Redding Bridge (Martin Luther King, Jr. Blvd) to the existing trail that runs underneath the bridge. Right now, this trail terminates just south of the bridge. This project will extend this connection approximately one and a quarter miles south to Walnut Creek along the east bank of the river. Plans are completely designed and engineered already. We have also been awarded $600,000 from the Transportation Enhancement (TE) program administered by GDOT to construct the trail. In mid-2017, the project received final approval from the National Park Service (NPS). After a public bidding process, Sam Hall and Sons was awarded a contract to construct the trail in July 2017, with support from the TE grant and Macon-Bibb SPLOST. The trail is expected to be completed in early 2018. 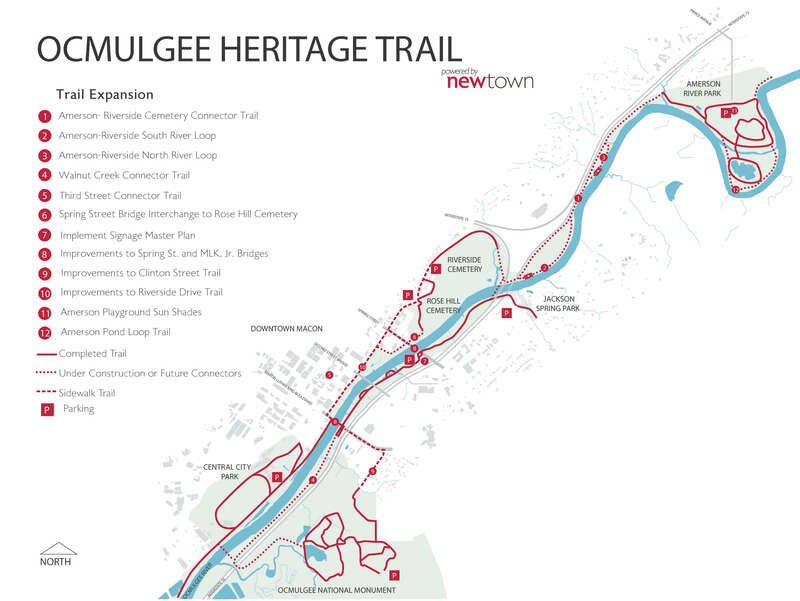 The Macon Action Plan recommended several expansions of the Ocmulgee Heritage Trail into downtown and neighborhoods that adjoin the trail. One of the most exciting proposals was the idea to join the trail with Third St. at the intersection with Riverside Drive and carry the trail along the underutilized median park on Third St. In June 2016, the Community Foundation of Central Georgia awarded a Downtown Challenge grant to the Urban Development Authority (UDA) to complete surveying, design and engineering for this trail expansion. An early estimate is that construction of this trail would cost $250,000 per block. The design is expected to be complete by December 2016 giving us a more precise estimate of expense and timeline to construct this expansion. Many years ago, NewTown purchased land and easements on the west side of the Spring Street bridge to connect the sidewalks on the bridge to the trail system of Rose Hill Cemetery. We also poured new trail to connect the existing Rose Hill trail system to the interchanges with the sidewalks. Unfortunately, political obstacles prevented the construction of the actual interchanges themselves. In June 2016, the Community Foundation of Central Georgia awarded a Downtown Challenge grant to Historic Macon Foundation to complete surveying, design and engineering for this trail expansion. This connection will enable users to access the trail systems of both Riverside and Rose Hill Cemeteries from the existing downtown trail system. The current plan will create an interchange from the sidewalk on the southwestern side of the Spring Street bridge looping under the bridge to connect with existing trail in Rose Hill Cemetery. We expect that this interchange will cost $350,000 to construct, and additional easements and permitting are necessary before construction can proceed. While Amerson River Park was under development, Dr. R. Kirby Godsey donated his salary from his time as Chairman of the Macon Water Authority to design a coherent signage for the entire Ocmulgee Heritage Trail system and install the first of these signs at Amerson River Park. The signage master plan was completed by Burt and Burt Studios. Our goal is to use this master plan to update the signage along the entire trail system to match those installed at Amerson River Park. We project that the cost to implement this master plan would be approximately $100,000. The only obstacle to this project is raising the funding to purchase and install the signs. The Macon Action Plan recommended specific changes to the existing plans proposed by Georgia Department of Transportation (GDOT) for the bridges over the Ocmulgee River on Spring St. and MLK, Jr. Blvd. Right now, GDOT’s plans do not include appropriate accommodations for pedestrians and cyclists. The Macon Action Plan recommends protected bike lanes and sidewalks within the existing bridge width and budget allocation to expand the trail. Because this project would not increase the cost allocated to the bridges, the only obstacle to this project is lobbying GDOT to amend their plans to accommodate cyclists and pedestrians. Illustrated in the Macon Action Plan. For many years, trail users have been able to access a side gate to the Ocmulgee National Monument by using the sidewalks along Coliseum Drive and then walking down Clinton Street. Because Clinton Street lacks sidewalks, the Urban Development Authority (UDA) has developed plans to improve the pedestrian and cyclist experience with sidewalks, lighting and landscaping. This project has been designed and engineered by the UDA. The Macon Action Plan recommended drastic improvements to the sidewalks along Riverside Drive to provide a protected cycle track alongside the existing sidewalk. The Downtown Challenge program awarded a grant to the Macon-Bibb Planning and Zoning COmmission to hire a contractor to complete a scoping study of Riverside Drive that could eventually enable construction of bicycle and pedestrian improvements. The scoping study will be presented to the Georgia Department of Transportation when complete to illustrate the benefits of pedestrian and cycle improvements on Riverside Drive. Illustrated in the Macon Action Plan. Since Amerson River Park reopened after a massive renovation, the park has become the most popular resource in the Ocmulgee Heritage Trail system. The playground is one of the only playgrounds in the region that is accessible to users with limited mobility. Unfortunately, the playground gets so hot during the summer months that it is not usable. Trail advocates have designed a solution of permanent fabric sun shades suspended on metal posts that would reduce the temperature approximately 15 degrees to make the playground usable year-round. The cost to purchase and install these sun shades is approximately $75,000 and the only obstacle is fundraising this amount. Originally planned as part of the massive improvement to Amerson River Park completed in 2015, the pond loop trail had to be eliminated from the project because of budget restrictions. The trail is fully designed, engineered, permitted and ready to build and would provide additional trail with views of the river. The trail runs on the edge of the oxbow outside the pond at Amerson River Park and is approximately one mile long. The initial cost estimate for this project is $350,000. Work could begin very quickly after funding is identified. The original plans for Amerson River Park included a trail to connect the grand northern river overlook to the Jay Hall boat launch. Unfortunately, this trail was eliminated from initial construction due to budget constraints. Macon-Bibb County Parks and Beautification department is working to build this trail, with its own employees and support from many community volunteers. The trail is now cleared, but approximately $125,000 is necessary to fund the installation of a necessary bridge and concrete along this section of the trail. Once completed the Amerson Boat Launch Trail will be 1800 linear feet.